Within 48 hours of the first signature, over 170,000 people signed a petition on the White House website imploring the President to charge 47 GOP Senators with a violation of the Logan Act. This is the most people who have signed a single petition in the history of the website. (Link). The speed of the public responding to the petition was breathtaking. The public is fed up with 47 GOP Senators disrespecting the Commander in Chief. The 47 GOP Senators are being accused of “a treasonous offense” with the publishing of the letter to the leadership in Iran. An unpalatable and pungent public outrage rises towards GOP interference. The public has seen enough disrespect towards the Commander-in-Chief as the hashtag #47Traitors trends worldwide. Imagine the Senate taking up a bill right now to disassemble the Logan Act as the public signs petitions for Congress to go to jail for 3 years under its provisions. Want to see a public really go ballistic? The experts tell us the law has never been tested. That means the court system can weigh in when a case has been brought before it. To get a case before the court, there needs to be someone charged. To get someone charged, you need an indictment. You need a grand jury to get an indictment. Because of the nature of the politics in this case there needs to be an independent or special prosecutor. So in order to get the Senators charged (as the petition requests), we need a special prosecutor. There needs to be an investigation if there is suspicion that a law has been broken. Isn’t that what oaths of office are all about; upholding the law? We need someone to defend the country against enemies foreign AND domestic. As for the President coping out on doing this. There are a large number of people willing to file a criminal complaints against the 47 GOP Senators – maybe over 170,000 of them. If he does not want to do it, where do we go to start turning the wheels of justice? What forms in triplicate do we need to fill out and file? From a political standpoint, this is a golden opportunity for President Obama to finally throttle the GOP. 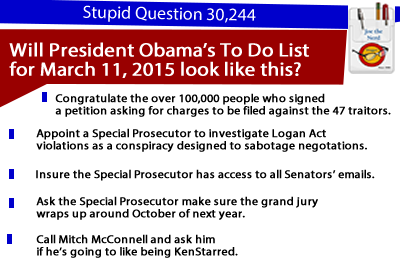 Call for a Special Prosecutor to look for violations of the Logan Act. Like the Benghazi Committee that demands all the State Department emails from the Clinton personal email servers; the special prosecutor has the ability to get all the emails from the 47 Senators’ email services. It will almost like each Senator getting his own personal Ken Starr. Given the amount of information on these servers, it could take months to process them. I can see a report coming out next October, right before the 2016 General Election. So if there are no indictments, the Senators in question will have a clean reputation to run with. If there are indictments found related to the Logan Act, due process is being used to correct the problem. If the law is unconstitutional – they got nothing to worry about. They were just violating a law they didn’t feel like following. The Senator can go to court and defend themselves. But having a special prosecutor looking at these Senators would also be interesting for the public to know what really is going on in Washington. We can finally see how the sausage is being made and maybe who is really writing the legislation. A potential side effect of a long, drawn-out Grand Jury process could be to make the Senators act properly; for maybe the first time in their adult lives. They would not want to tick off anyone in the juror pool. The Logan Act would not seem so passe anymore. if a special prosecutor starts drilling down on some of the Senators. They may ask for a plea deal on a Logan Act charge rather than risk what the investigators may really find.